“We held on to the core of being Southern in terms of niceties,” says Florida-born artist and educator Janathel Shaw of her family's migration to Washington, DC when she was six years old. Though she became a fast-speaking city girl, the vestiges of her Southernness show in her hospitality as she offers a thoughtful selection of beverages and healthy noshes upon my arrival for a private viewing of her solo exhibition, SOLIDAREity! at the member-owned and managed Touchstone Gallery, where she has exhibited for years. Incorporating both graphite drawings and ceramic sculptures, this show of figurative works offers an unapologetic exploration of Black life in America from its earliest heroes to its current torchbearers; from the sunny flashes of hope to the condemnation of dark forces poised to decimate the community. It is, ultimately, a call to consciousness, an affirmation of the strength and solidarity of a people. Drawing was Janathel's first medium in childhood, and to this day she puts pencil to paper, often in large graphite portraits. From left, her sister, Dorethea studies Here to Stay, ©2017 center, Prodigal Son, ©2015, a rendering of her son Maurice; a gallery patron stands before The Poet, ©2015. Dorothy Mae Shaw named her first-born Janathel, a portmanteau of her husband James and mother Ethel's names. Daughter Dorethea would follow, then finally, Jay. Small town life was dramatically different than the urban lifestyle the family would take on with the move to the nation's capital. In flashes of memory, Janathel recalls Florida living: a languid pace, doors that were never locked, sitting on the porch with family, and instead of an ice cream truck, mango trucks that sold "juicy fruit bursting with flavor" at 25 cents a pop. “It was akin to the Black version of Mayberry,“ she says. She smiles as she speaks of her “deliciously country,” Aunt Evella. The one who “wasn’t sadity;” who had a black pig, an outhouse and ice-cold bottles of soda, "glass, of course," that she allowed the children to drink freely. Although she appreciates the quaint charms and sense of community in Fort Pierce, Janathel is much more inclined toward metropolitan living. When her parents separated, her mother, a highly regarded teacher, found a teaching post in Washington, DC. Both Dorothy and her sister Carolyn made the move North, finding homes near each other. Janathel is grateful for their example as strong female role models. “My mother taught me the importance of resiliency—that women can do it. She kept us rooted in church," switching denominations from Baptist in Fort Pierce to Pentecostal in DC. “But she always chose small, storefront community-oriented churches. I think she wanted to recreate some of what she had in Florida." Attending Holy Commandment Church of God (Seventh Day), her mom eventually became "Mother of the Church." Janathel speaks admiringly of her mom and aunt 's efforts to instill values and cultural awareness in their children. "And education was a BIG thing." Very early in her church-going, education-oriented, woman-centered upbringing, Janathel learned to draw; loved it. She knew by the age of seven that she wanted to be an artist. She shared supplies with her Uncle Ray who did paintings on wood, and in truly iconic 1970’s fashion, on black velvet. Janathel attended DC Public Schools, but never at a school where her mother taught. Mrs. Shaw did not want that pressure on her daughter. By the time Jan attended Hart Junior High School, she knew she “didn’t belong.” She hated it and the sexist course selections of the era. Though the school offered woodshop to boys, girls weren’t not allowed. “I had to take home economics,” she grumbles. “And I couldn’t care less about making the perfect pancake.” The boon in her experience there was meeting the teacher Mrs. Washington, “the Frances Cress Welsing of Hart Junior High. She was this authoritative, dignified black woman. You will speak articulately!" Janathel mimics. "She spoke about pride and integrity.” And it was upon her suggestion that Jan enrolled in theater class. But still, Janathel wanted out, and Duke Ellington School of the Arts seemed a perfect opportunity to find her arts tribe." Her mother had wanted her to become a lawyer, but conceded to her wish, with her promise to maintain her 3.6 grade point average and just a bit relieved that she’d be attending school across town away from the possibly impending neighborhood chaos. “We didn’t have to duck and dodge bullets, though,” Janathel makes clear. "It was a hard-working community in the Anacostia area; mixed blue and white collar, but not wealthy." Elizabeth Catlett, Singing Head, 1980, black Mexican marble. Collection of Smithsonian American Art Museum, a work that deeply inspired the young visual art student. Senior portrait, Duke Ellington School of the Arts 1980 yearbook. "Pearl Bailey came by the school. Debbie Allen came by the school. James Brown came by the school." She laughs, "Some of the kids were acting silly and fell out in the street. James said, 'You don't even know who I am, get up from in front of my car.' And the guy from Pippin, Ben Vereen, came too. I remember sitting in the auditorium thinking how blessed I was because they weren't going to the other schools. I used to love watching the other kids perform. They could let loose and be themselves. We had Denyce Graves; they weren’t singing opera at regular high schools. I loved going to school, carrying my portfolio and my supplies, sitting down, and doing my thing." And she speaks almost reverently of Ellington board member Peggy Cooper Cafritz, the avid art collector and philanthropist instrumental in bringing the school into existence. “I remember her coming to the school— short cropped afro, really big earrings and talking to us about the arts; how much she really wanted to create a place where students could fully pursue them. She especially wanted kids of color to fulfill their potential in the arts. I knew that she was very active in making things happen for us and that the school would not have come to fruition if not for her. I saw her as a fierce woman benefactor." “Whenever she spoke to us it was always in a way to embrace us; we always felt important when she was there. I remember going to her house, she'd invited us to her home for a cookout, and we had free reign. It wasn't 'don't go down that hallway; don't touch my artwork; don't sit on my sofa.' It was 'spread out and enjoy yourself.' She was extremely gracious.” The experience was a revelation for Jan. She'd never seen Black people "live in such an opulent fashion," she says. "Peggy was walking around her huge backyard, and she’d look and smile and ask if you were enjoying yourself. I thought, she spoke to ME? I knew that she was somebody to be reckoned with and that my teachers respected her." "I had no idea of the monumentality of this woman. We needed Gordon Parks with his beautiful photographs to show the reality of what was going on, but we also needed the Archibald Motleys and the Elizabeth Catletts and the Augusta Savages. The more I learned, the more my universe expanded." Upon graduation, she attended Howard University, but soon took time off after the birth of her son Maurice. Her mother had already laid the blueprint for beautifully raising children as a single parent. "I tried to raise my son with the same nurturing, commitment and dignity that I learned from my mother," she says. Eventually she went back to school, enrolling at Prince George’s Community College, where she worked as a graphic designer on campus and attained an Associate Degree. Her instructor, John Krumrein, had attended George Washington University’s (GWU) Columbian College and suggested she apply. He wrote her recommendation. She worked full time, paid a babysitter during days, and went to school at night. She is grateful for family support in caring for her son in the evenings. It was challenging. She frequently felt left out at faculty/student gatherings where she “would be in the middle of the room and no one would talk to me. There were some classes I couldn’t get into.” She remembers one British professor saying that he was welcoming the underprivileged to his class. As an educator today, she tries to prepare her students for the “classism and different types of isms” they may encounter as they navigate academia. The grad student working on Sistah Anger from her ©1994 Sistah series. Photo by Andrew White. A work, cut and hollowed. “Sometimes I would take Maurice with me to school and sometimes that didn't work out, but I wanted Maurice to know that his mother was an artist." Her giggling, toddler son would accompany her to art shows, and there were times when he painted over his mom’s work. So she created canvases just for him. “I said, 'Sweetie, you can't paint over Mommy's paintings,' and we'd paint together.” Young Moe became accustomed to his mother painting "in the wee hours of the morning or late at night. I wanted Maurice to understand what it was like for Mommy to have a dream and watch her try to pursue it." Dubbed the "Murder Capital of the United States," 1990's Washington, DC was, at times, a frightening place to parent a young black boy. Vigilance was paramount. “I had to slow my roll a little bit to mother my son.” When Roger, who'd had a peripatetic presence in his son's life passed away, 15-year-old Maurice mourned deeply. Jan once dreamed of a particular measure of artistic success by the age of 35, but life, as it does, happened. With the passage of time and acquired wisdom, perhaps her oeuvre has been quietly incubating. “Maybe my art is taking on a level of substance it didn’t before.” She’s observed the commitment and practice of such local artists as Renee Stout and the late Alma Thomas, whose trajectories into acclaim weren’t swift, but rather the result of persistence and dedication. Hers is an art-filled home with works of her creation and those of other artists whose work speaks to her. “It gives me joy to wake up and see art on my walls.” In imagining her arts legacy, she hopes that her work will be acquired at the museum level and that her “voice as an artist, as a woman artist and a black artist” is heard, felt and understood. "I always see art as a legacy. Our time on this Earth is so short; I always think well what are you going to leave behind? The evidence of your existence besides existing in people's hearts is that which you have created. That's legacy. I'm hoping my work says Janathel Shaw existed and she had something to say." She hoped to leave her artwork and the works of artists she's collected to her son. Sadly, Maurice—who shared his mother's eyes and smile–passed away in April 2015 at the age of 32, after quietly and bravely battling cancer. Maurice Kewan Shaw. Jan's gentle, beloved Moe. May he rest in eternal peace. Just months before his passing, Moe encouraged his mother as she was preparing a solo show. When he observed her lethargy he questioned authoritatively, "Don't you have a job to do? How many pieces do you need to have? What are you going to do about it? I said, 'Boy who you talking to? I'm your mother.' He said, 'I know who you are. I also know what you have to get done." And at that show, he stood proudly beneath his mother's graphite portrait of him. Being a mom is the single most defining part of Janathel's identity and it informs her work; mothering Moe the greatest blessing of her life. Future Deferred, ©2015 I wanted to acknowledge the death of the young men who died like Jordan Davis, Michael Brown, Trayvon Martin and Tamir Rice, the little boy who was killed for playing with a toy gun." Using sgraffito technique—drawing on clay–she "tattooed" their faces on the neck. She'd made the piece all white to try to emulate white marble sculpture," and showed it in her show Unspoken Messages. At the time, Moe suggested that making the figure black would have given the piece greater impact. "It wasn't until shortly after his passing that I looked at it and I realize I'd chosen a crackle glaze and I chose it for a reason. I'd done all the tattoos; I'd done the drawing in sgraffito and thought it does need the high contrast of black, not just in terms of the message of black pride and strength but to be able to see it. Also, it looks like it's undergone some travail but hasn't stripped away its dignity. I put in a black stain on top of it, and the piece just went Pow! I said, 'Maurice, baby you were right.' He was right. “I’ve said I have to actually discover who Janathel Shaw is. Part of that discovery did come forth when I was at GW; a lot of my work had to do with the black community. I had no idea that I’d carry that central theme throughout my work." What she did know is that abstraction is not her forte. "My work is representational," she says. "Though there’s not a genre that I can look at in general and not find something to admire. I love Greek sculpture; I love Vermeer, Rembrandt. I love Frida Kahlo." With clay, she’s not interested in creating pottery though she admires the work of several potters. Her work bears “meaty” messaging; not idealized imaging. Though she can fully appreciate works crafted for aesthetic beauty, decorative themes do not drive her work. "When I create, my overall intent is not to make pretty art, but art that has meaning." Although she paints as well, it is her earthen works, ceramic figurative sculptures and reliefs that have garnered her the most acclaim. She became interested in 3-dimensional work as a student at Ellington, inspired by the work of instructors Stanley White (Ayokunle Odeleye) and Billy Harris, who "was welding and working in wood; creating pieces reminiscent of African symbolism." She wanted to be challenged in her work, "to tackle something that was completely out of my depth," she says. "Pencil is friendly— you can put it on paper, make a mess and start over. If you're welding, you're talking materials that could be dangerous. When you're working with wood, it can crack if you go against the grain. I didn't have the patience, true love, and fortitude to create in wood because it required you to understand where the grain was and to then chisel, chisel, and chisel. You had to be able to talk to the wood, be a wood whisperer. I took a class and was extremely frustrated. Whenever I see a quality piece of wood sculpture, I have huge respect. I feel the same way about working in stone." White/Odeleye left the faculty before she could take a class with him, but she was pleased when Martha Jackson (now Jarvis) joined the staff. "Martha introduced me to the ceramic medium. I touched the clay, and I connected with it," she says, remembering the resonant text from James Weldon Johnson's The Creation she'd recited at church: Up from the bed of the river God scooped the clay; and by the bank of the river He kneeled him down...Kneeled down in the dust toiling over a lump of clay till he shaped it in is his own image. "I thought, I can create with this and I liked the idea that it came from the earth." She'd take the deep dive at Prince George's Community College (PGCC), taking classes in Ceramics, Painting, and Design. Because she'd had an illustration background, her early works were architectural clay slabs on which she drew, painted or glazed. She realized that her large slab formations were directly influenced by the work of Martha Jackson Jarvis, and sought to find her individual voice in the medium. "I went from making vessels to making figurative pieces. I had a good experience there." With an Associate's degree and Krumrein's encouragement, she went on to GWU. She "wasn't really knocked out by working with pottery," though she thought "working the wheel a good skill to learn." So she made "rudimentary forms and coil pots which are very satisfying." She references the "beautiful work of Maria Martinez, a very famous and humble Mexican artist working with the subtraction method"—using a carving tool to take away the excess clay to create the desired form. She explains that though the ceramics medium is often relegated to craft—much to her chagrin— it is no lesser an art than those of the "major" arts. Working successfully in clay requires a delicate balance of aesthetic vision, artistic skill, an understanding of the properties inherent in different clay bodies, drying times, temperature and optimal thin or thickness of the clay. Working on a pottery wheel, "you can control the thinness of the piece; when you're working with sculpture, it's a totally different entity," she says. "Clay affords me more immediacy, but the sucker can disappoint you; you could work on something for a month, and it doesn't work out." If temperatures go too high, pieces can melt. Pieces can fracture. Sometimes a glaze may not bond with the surface and peel away in what's known as crazing. There's a science to glazing. "When you glaze a piece, you haven't painted it," she declares. "You've put chemicals on it that hopefully will react the way in which you want them to." At PGCC, Krumrein made the glazes for his class, but "at GW, Turker said 'You're going to learn how to make your own glazes; how to make your clay. If it falls apart or melts, deal with it." All part of the learning process. And for an artist without STEM leanings, learning glaze calculation was a challenge. With so many variables on the line, she laughs that among the students, "there was a lot of cursing going on in the studio." Janathel came to "perceive ceramics at another level. I'm no one-trick pony; you need to learn a variety of things," she says. She learned several processes: mold-making, hand-building, coiling; how to create an armature on which to build a piece, cutting open a piece to remove the excess clay, and finally, how to reassemble the hollowed-out elements seamlessly. "You make your piece all nice and purty, then you gotta cut that puppy," she laughs. Bruno Lucchesi, the Italian master figurative sculptor, spent a week with Jan's GWU cohort during their thesis time. "This joker is amazing! He builds relief sculptures, then has them cast in bronze, and he can make a ceramic sculpture in under two hours," she exclaims. Though she'd been creating armatures for her work, she learned well from Lucchesi. She often uses paper armatures, which dry a piece from the inside-out. "EVERYTHING is about timing when you are working with clay," she reiterates. Janathel has never shied away from political art. Left, Still A N___/No Entry, ©2014 In her latest show, SOLIDAREity! she presents the powerful archival piece, because it remains as painfully relevant today as iit did when she created it as a grad student. Death God fo da Young'ns, ©1995 (installation) Ceramic with glaze, bullet casings, gravel and wood. She explains: "Death God grew out of my sorrow for the continued loss of young lives to violence, miseducation, misguided manhood rights and societal violence. The ceramic figure represents a deity that demands and feeds off the tragic deaths and unknown possibilities. The scarifications on the body are shown defiantly, and the visage of the figure is a distortion of what should have been a shaman or spiritual figure. At the base of the form lies bullet casings and empty shells of urban warfare. Some of the casings were actually found in a playground." Timing played a part in her teaching career as well. She knew from growing up with an educator mom just how demanding and thankless that calling can be. "I did NOT want to be a teacher," she says. I got into teaching because I knew, as a single parent that I needed a full-time job. I saw it as an opportunity to put food on the table and provide insurance for my son." Her pedagogy began with a workshop in ceramic sculpture; then several totem-building workshops, including one at the National Museum of African Art. She decided "I'm going to teach art, not a crafts class. I'm going to teach art in the way that I was taught at Duke Ellington." She set her limit at six years, with a plan to become the best teacher she could be. Her deadline came and went as she had "fallen in love with giving back. I got into teaching as a way of making a living, and along the way, I learned how to become an art educator. For me, it's not a formulaic lesson plan. I create my own lesson plans." The teacher, working on theatrical set design with her DCPS students. Photo courtesy Janathel Shaw. She once told a student to woo a girl with his understanding of art. One day she spied that student escorting a young woman around the National Gallery of Art. "I tried to hide so he wouldn’t see me while I heard him taking her through the exhibition. He was seducing her with art, and I loved every minute of it. He’s now teaching at the same school I am." "If I’m not in the midst of creating or resting, I hit the streets to check out the art scenes here, in Baltimore, Philly and New York. I live in museums. I like studying the art at my leisure and I like surreptitiously staring at the faces of the visitors. Each face tells a story. I find the elderly especially beautiful. You can just call me an art nerd of the highest order. I can go to most art museums and stay there for hours without stopping for lunch. There’s something about being surrounded by art that soothes me, encourages curiosity, and motivates me to push my own work to another level.” Her favorites, by and large, attest to this. Star Wars introduced one of the most favorite cinematic robot duos of all time: the astromech, R2-D2 and his humanoid counterpart, C-3PO. RIght, Maurice's interpretation. 1. Moe's drawing of R2-D2 & C-3PO. A fan of the George Lucas franchise, she cherishes the image of the iconic Star Wars droid characters her beloved son created when he was nine years old. Seated near African American sculptor Edmonia Lewis' famed 1876 sculpture, Death of Cleopatra, Janathel sketches the 1905 Elisabet Ney marble, Lady Macbeth at SAAM. 2. Drawing at Smithsonian American Art Museum (SAAM) and National Gallery of Art (NGA). "My favorite spots are the third floor in the Modern Art section of SAAM and the quiet encased area of varied works near the Conservation Lab on the National Portrait Gallery side. It is routine for me to go upstairs, find a comfortable seat and draw marble sculptures for an hour or so to improve my drawing skills. I love to go the second floor of NGA in the west wing and draw the marble sculptures in the Dutch Galleries and on the lower levels that contain sculptures by Rodin. This extends to NGA’s Sculpture Garden which houses an ice rink during the winter and a large fountain during the summer months. The National Gallery of Art is the closest thing that Washington, DC has next to the Louvre. It’s not as intimidating because of the massive size or collection. I can go into familiar areas, sit, and ruminate. I also like it when I happened to visit on a day that a copyist is there recreating a painting in the collection." 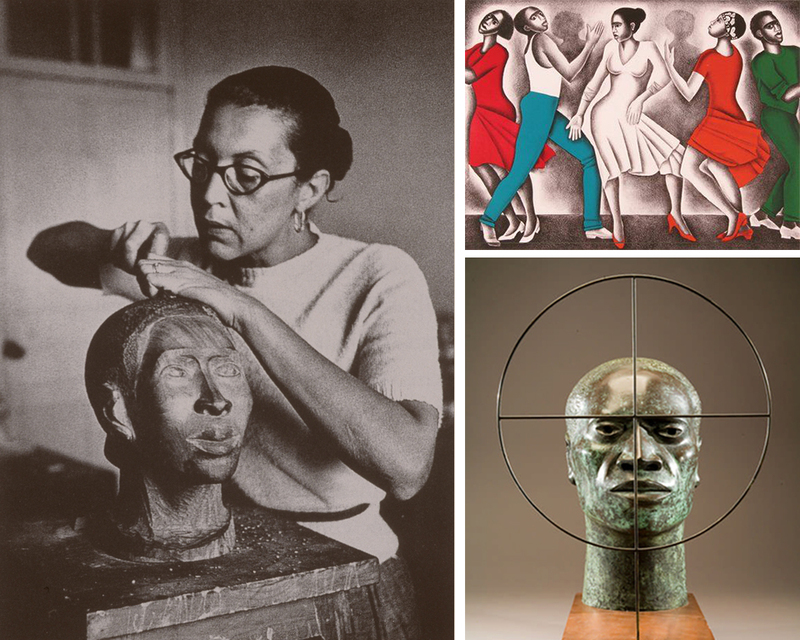 Elizabeth Catlett at work on a bust. Dancing, 1990, Color lithograph. Target, 1970, Bronze. 3. Elizabeth Catlett. The late artist has been a role model for Jan's professional career. She is inspired by her proficiency in several mediums and her prolific output. "Her ability to just kill it with her master skills to create sculptures and prints that speak to the Black experience has wowed me for years." Seeing Target for the first time was like a "full-frontal punch," she says. "it was palpable." She writes about the piece in her MFA thesis. Janathel makes no apology for the variety of her favorite authors. Here, a few including Nikki Giovanni's Ego-Tripping. 4. Reading. "Books stimulate the psyche just as much art. I am a fan of Octavia Butler’s work, J. California Cooper, Nikki Giovanni, James Baldwin, Patricia Brigg’s sci-fi fantasy Mercy series, J.K.Rowling’s Harry Potter series, and Star Trek: Legacy series. I am drawn to characters that overcome adversity and create new realities for themselves." Magdalene Anyango N. Odundo, Reduced Mixed-Color Symmetrical Piece, 1990, ceramic, slip, Collection of the Smithsonian National Museum of African Art. 5. National Museum of African Art. "It reaches me on an intimate level and invites me to connect with my ancestry. I love the sculptures in the permanent collection especially the gorgeous ceramic vessels by Magdalene Odundo. I met her through a workshop coordinated by former Director of Education Veronike Jenke and artist, Winnie Owens-Hart. I felt a kinship with Ms. Odundo through our mutual love of ceramics. Here was an artist that wasn’t pretentious, she had some tools out, large coils of clay, wearing comfortable slacks and her hands were caked with clay. She talked about her method, background and creative process while creating one of the most perfectly symmetrical forms that I have ever seen. Each time that I see her work on display, I am in awe. It’s all about the form and the burnished surfaces. I marvel at the mastery that’s exhibited in the construction and the terra sigiliata that she creates to burnish her forms and that create varied natural hues after firing." Detail from Charles White, Untitled, 1950, ink and graphite on paper. Collection of Smithsonian American Art Museum, Gift of Julie Seitzman and museum purchase through the Luisita L. and Franz H. Denghausen Endowment. 6. Charles White. "In respect to drawing, I love the work of Charles White. I know that he and Elizabeth Catlett had a volatile first marriage, but the man could draw. His portraits and figurative drawings have character, expressions that look right through you and his figures have meat on their bones. His women are not the stereotypical petite curvy figures. Their hands are broad, their features are strong with high cheekbones and piercing eyes. Love, love the contrast between light and dark and textures created from the layered lines. His contemporary John Biggers is just mind blowing awesome. These artists had a love and reverence for the Black community and history and the narratives are artfully shown in their masterful drawn marks." View from the dock; Jan and Moe. The family gathers for dinner. Photos courtesy of Janathel Shaw. 7. National Harbor, MD. It holds treasured memories as a "go-to spot to have special family dinners with my son," she says. "There’s a serenity sitting in a restaurant or on the dock watching the sun rise or set by the water." Left, Joseph H. Hirshhorn Museum and Sculpture Garden, designed by Gordon Bunshaft of SOM © Ezra Stoller | Esto. Right, Robert Arneson, General Nuke, 1984, glazed ceramic and bronze on granite base. Collection of the Hirshhorn Museum and Sculpture Garden, Smithsonian Institution. 8. Hirshhorn Museum. I expect to see one or two new exhibitions that show contemporary art that is in pace with what’s happening in the art world. The exhibits are varied but often, I am visually satiated. A favorite of mine in the permanent collection is Robert Arneson’s ceramic sculpture, General Nuke. Arneson’s manipulation of clay is magical and he was never afraid to explore social issues through his work." (General Nuke addresses nuclear weapons proliferation with the General's bust atop a blackened heap of bodies; his nose, a nuclear missile.) "Texture is necessary in his work. I love that he deliberately left his finger grooves in many of his pieces. It wasn’t the masculine aspect, but the artist mark that conveyed voice." 9. Her Story by Tim Okamura. Honored to have been immortalized by the master portraitist, she exclaims that this painting "will be one of my faves for all time!" 10. Nancy Wilson. Janathel creates to music, "usually jazz or rhythm and blues. It speaks to how I’m feeling and it also creates a harmonious barrier from that which would distract me. What’s funny is that I’ll find myself creating to the tempo of the music," she says. What's in heavy rotation on her current playlists? The ever elegant, self-professed "song stylist," Miss Nancy Wilson. Find Janathel Shaw on Facebook, Instagram, Twitter and gallery-hopping the Eastern Seaboard.